Just exactly where do you live these days? I'm a native New Yorker, from Westbury, on Long Island, and spent most of my adult life in Massachusetts. That is, until 2007, when I, along with my husband, began what you might call a peripatetic lifestyle for nearly ten years: Tel Aviv; Los Angeles; Stillwater, Oklahoma; Seattle, then finally a return to Massachusetts. It began with an invitation to be a visiting writer at an Israeli university and just sort of took off from there. I once counted the number of addresses I've had in the last ten years and came up with fifteen. You expect this in your twenties - I remember my mother showing me her address book with all the cross-outs next to my name - but in middle age? People want to know: What was it like? Did I miss my own living room? Dishes? Friends? Well, yes (friends) and no (the dishes). It was a pretty amazing odyssey. New languages (and I don't mean only the officially foreign ones). New landscapes. New people. And new, or rediscovered, sides of myself. It had its challenges. It was also a great gift. Rumor is you used to be a lawyer. How'd you get into writing fiction? The rumor's true. I started writing fiction shortly before I turned forty. It wasn’t a mid-life crisis (what's mid? ); I’d always been writing - poetry, songs, essays - but I was occupied with other things. Day jobs. Starting a family. But when I began to write fiction in earnest, it was like falling in love. Not with my writing but with the sheer exhilaration of making things up. Of inventing a situation and following a character around until something happened to him (and usually it was a him; for a long while women were too close for me to write about; now I write about women all the time). Who knew writing could be this way? I was hooked. There are almost always lawyers at my book talks, often waiting on the fringes until everyone else has gone away and then whispering, like criminals, their secret desire to write fiction. I try to warn them. They too could fall in love. Be prepared. Your neighbors (when you're in one place, anyway) say they can see the lights on at all hours. I'm guessing it's not insomnia. Correct; I sleep like the dead. Just not when most people sleep. I’m a night person, and my best hours for writing are between midnight and 5 am. When my children were small, they were allowed to come into my study when they woke up with bad dreams as long as I didn't have to talk. For years, every night there'd be a small boy or two dragging in a blanket and falling asleep under my desk. It worked for all of us. We hear there's a serious literary pedigree in the family. Yes. Allen Ginsberg was my father's cousin. We had all his books, and his father, Louis Ginsberg's, books. It was a matter of great family pride even when Ginsberg was still considered rather scandalous. Allen's mother's maiden name was Naomi Livergant, from which my father's name, and mine --Leegant--was Anglicized sometime in the 1930s. She was the connection. I met Allen Ginsberg only once. It was in the late 1960s and I was an awestruck teenager when he came to perform Buddhist chants at the Westbury Music Fair. We went to see him backstage after the show. He hugged my father and asked if we could get him a pastrami sandwich. I remember I was surprised. I thought he'd be a vegetarian because of the chanting. One of my greatest regrets is not having sought him out as an adult, not because he was famous or a brilliant poet but because I've heard he was very nice. For more about writing craft and the writing life, click here. Joan has a B.A. from Harvard, a J.D. from Boston University and an MFA from Vermont College. 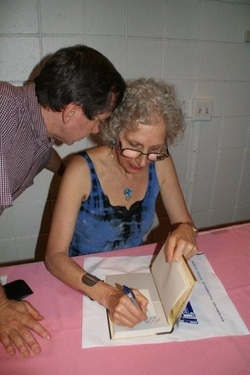 From 2007-2013, Joan was the visiting writer at Bar-Ilan University outside Tel Aviv. She also gave talks on American literature and culture throughout Israel under the auspices of the U.S. State Department and was a volunteer ESL teacher for African refugees who'd crossed the border from Egypt fleeing genocide and persecution. At the time there were approximately 55,000 African refugees in Israel. From 2014-2016 Joan was the writer-in-residence at Hugo House in Seattle. Joan is married and the mother of two sons, a videographer and an artisan woodworker/designer who clearly inherited their excellent spatial talents from someone else.